1. Side Chain the guitar to the lead vocal – This is a simple effect to set up. If you find yourself at the end of the song, and the lead guitar and vocal are both wailing away at the same time, this will help you mix them together. Send your vocal to a bus. Make that bus the key or side chain input on a compressor that is on the lead guitar track. Now when the guitar is playing and the vocals aren’t singing the track will be out front. As soon as the vocal comes in, it will trigger the compressor on the guitar track and duck the guitar by an amount you set with the threshold. 2. Use a compressor to sculpt the room mics – I always record room mics with my drums. This simple trick can make room mics in a small room sound bigger, and have more energy in a large room. You want to let a little bit of the transient go through. Set the ratio up around 6:1, and you release to its fastest. Then slow your attack down until your letting the transient through. Bring the gain up a little to level match. You will notice that you have a little more exaggeration on the transient and you can hear the tail of the room sound more. 3. 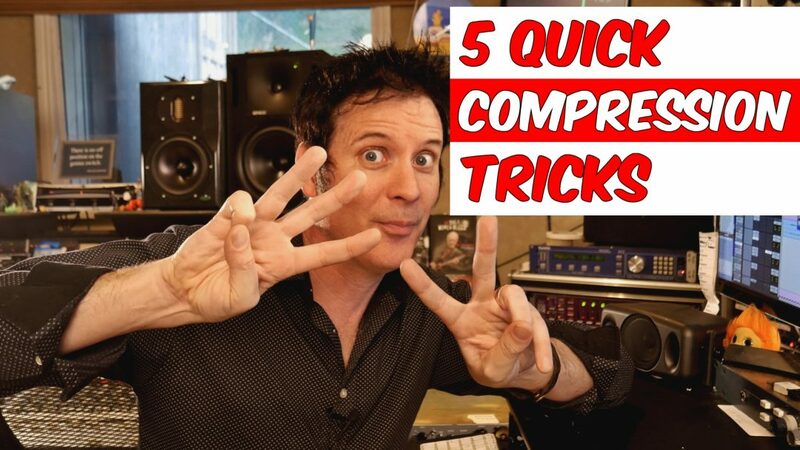 Set up your compressor like a transient designer – for this trick we start by duplicating the track. On the duplicate place a compressor and set it up for fast release, and slower attack. You want the transient to come through. Then you can double the compressor, and set it up the same way as the first. You will get a ton of attack out of this setting and it adds a bit of spankiness. No you can blend this duplicated track back in with the original untreated snare. This will give you the same effect as adding a transient designer. 4. Side chain overhead mics to the main snare track – This is another very useful side chain compressor trick. If you record your overheads and you find that you have too much snare sound in them. You can simply setup a bus on the main snare channel. Send the bus to a compressor on the overheads. Now, every time the snare drum hits, it will trigger the compressor and duck the snare down in the overheads. But when the snare is not playing your cymbals will uncompressed. 5. Duplicate the track and nudge it backward to setup “look ahead” compression – This is a simple trick to create look ahead compression. There are compressors that do this, but for simplicity’s sake, we are going to create it ourselves. For this example I used a shaker track in the video. I duplicated the shaker track, and nudged it foreward a bit. Now we set up a side chain buss on the duplicated and nudged track, and send it to a compressor on the original track. It works perfectly for the shaker track in our example because I that transient is fast, and I want to squash it a bit, and bring up the tail and energy of the shaker.